Check out our schedule for a class near you .. 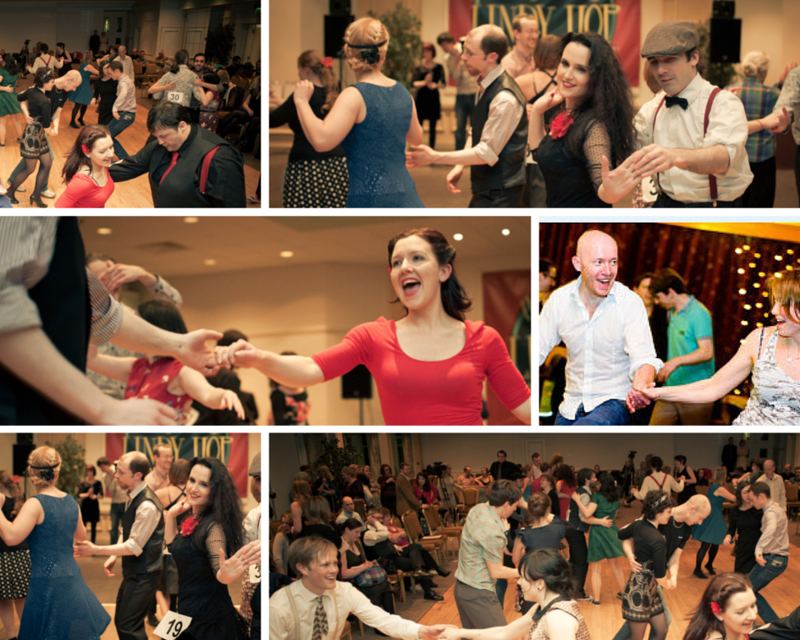 I remember my first swing dancing class – it was at the Trak in Toorak (Melbourne) with Swing Patrol. We learned the Charleston, and my love affair with swing dancing began. As with many new dancers, I wanted to practice at home what I’d learned, so I began to scour record shops for appropriate swing music to practice (this was many years before on-line downloads and some time before there were on-line aides to help source such things). I came away with my little piece of gold – a Glenn Miller CD. At home, bedroom door locked to protect my dignity, I settled on ‘Little Brown Jug’ as my song of choice to help perfect my Charleston. Well, let me tell you, it was fast. My feet stuck firmly to the floor in bewildered confusion and my legs refused to move. How could people dance to this speed? I kept working at it, sometimes without the music, then trying it again with the music. It slowly came to me. The Charleston was the first dance I learned, and is still the first dance I love. 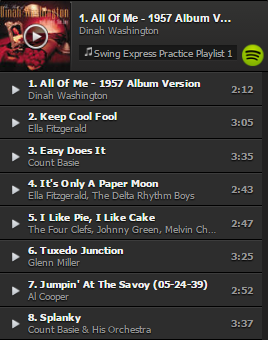 In honour of those early days of trying and failing, then trying and failing just a little less, I would like to present to you these 10 swing tracks for beginner dancers to practice to. We have created a spotify playlist so that you can listen to them too! All Of Me (Dinah Washington) – great for some slow Lindy Hop practice. Keep Cool Fool (Ella Fitzgerald) – slow to gentle Lindy Hop practice. Easy Does It (Count Basie) – gentle Lindy Hop practice. Paper Moon (Ella Fitzgerald) – gentle Lindy Hop / slow Charleston. I Like Pie, I Like Cake (Four Chefs) – just some all-around good fun. Tuxedo Junction (Glenn Miller) – also great for some gentle Lindy Hop. Jumpin’ At The Savoy (Al Cooper) – moderate Lindy Hop / gentle Charleston. Splanky (Count Basie) – moderate Lindy Hop / gentle Charleston. Moten Swing (Barney Kessel) – upping the Lindy pace just a bit. Shimmy Like My Sister Kate (Mugsy Spanier) – great for some Charleston practice. Do you have a favourite song? Help others find new songs by commenting below! Many people resist the idea of attending a dance class. I have heard the same reasons time and again – ‘I have two left feet’, ‘it wouldn’t be my thing’ and my favourite, ‘the fellas would give me hell if they knew I was going dancing’. 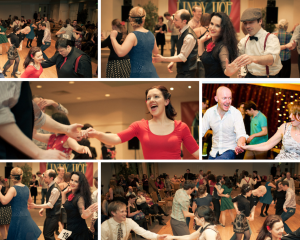 It can be easy to find excuses not to try something new but here are our top 5 reasons why you should give swing dancing a try! Believe me, I get it. We all had to start somewhere. I was in my late twenties when I started dancing. I was into football and cricket. I liked hanging out with my mates. Plus finding the time after work? It seemed there were more reasons not to go than there were to actually make the effort, but I went anyway, and I’m glad I did. Dancing is a great time, and especially in a classroom situation, it feels safe. You don’t have to feel self-conscious about what you’re doing because, basically, there’s someone to show you exactly what you should be doing. You can relax. You can have a laugh. And if you make a mistake it’s no big deal – others are making exactly the same mistakes. The group attains a feeling of commeraderie as you work together to master something that was unknown to you all just a short time before. You will meet so many new people, from very diverse backgrounds. Dancing brings people together in a way few other activities can. Through dancing you have immediate access to social groups, quite literally, all over the world. Wherever you go, if you can dance (even just a bit), you can drop into a local dance night and immediately make new friends. Dancing is a great equaliser – we are all there for the same reasons. Love of dance. Love of music. To have a great time. Friendship becomes the pillar on which a dance scene is built. Dancing is, surprisingly, relaxing. I know of many people who have come out for a class or a night of social dancing after a particularly horrendous day at work (or home) and come away feeling so much better. It sweeps away your troubles. It gives your mind and your emotions a respite from daily stresses. I have seen people use dance as a therapy to recover from trauma, to get over a bad break up, to overcome shyness and to recover from ailments that would have normally left them in the doldrums. It’s a tonic for frayed nerves. It makes you happy. And what about our reasons for NOT coming. You have two left feet? It’s our job to fix that. You just kick back and enjoy the process. We’ll make one of those left feet a righty soon enough. The fellas will give you hell? Maybe, but they’ll hush up pretty quick once they see all those wonderful people you’re dancing with, and they’ll wish they could do what you do. And as for it not being your thing? Well, did you not just read the above. Give it a try, I think you’ll be pleasantly surprised. 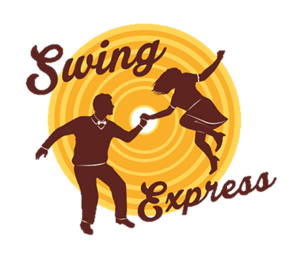 Swing Express teaches dance classes around Birmingham and the West Midlands – Find a class to suit you on our schedule!